In my seven years living on the road I have camped out more nights than I have slept under any one roof. I love camping, but every now and then I suffer through a wretchedly wet night. I can handle being cold. Getting wet, really wet, in the kind of rain that drowns any tent and necessitates a trip to the laundromat to dry everything out the next day, is pure, abject misery. This past weekend, camping in a rainstorm in the Pawnee National Grasslands east of Denver, I didn’t get wet, thanks to the Teardrop, but I also didn’t get any sleep. In that one night, I saw more lightning than I’ve ever seen in my entire life. It’s hard to sleep when you’re sure you’re about to be incinerated. What a storm! All night long, torrential rain washed the outside of the Teardrop. 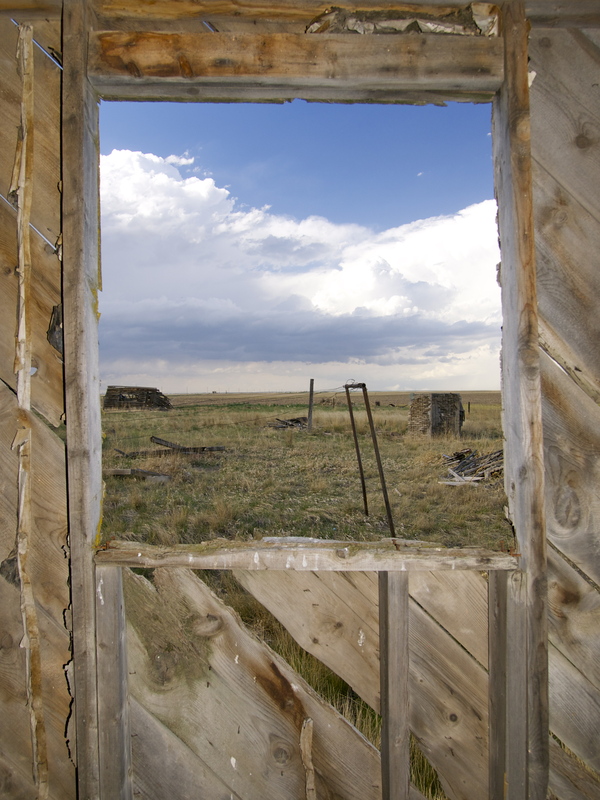 The wind was so powerful that we were sure we were being blown halfway across the prairie. I can sleep through rain and wind. In fact, rain pinging and pattering on the outer skin of the Teardrop has quickly become one of my all time favorite sounds. But I could not sleep through that lightning storm. I know that in theory, a car is the safest place to be in a lightning storm. The Teardrop is made of metal and sits on rubber tires, so it should provide the same kind of protection. It’s a nice theory, but I really didn’t want to test it out. The bolts I saw exploding out of that sky were beastly, more powerful than god. I’m sure that if one hit the Teardrop, it, and I, and everything I own, would explode into stardust. 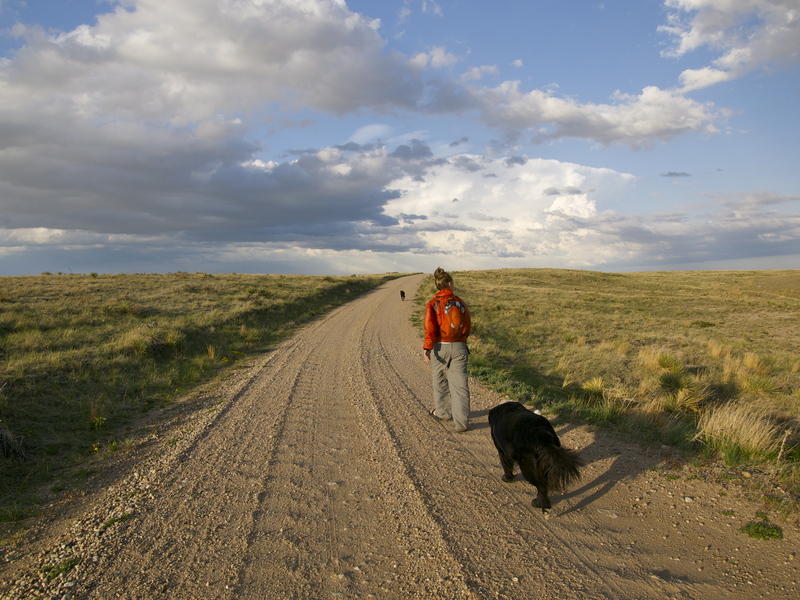 After camping on that wide open prairie, I know how it feels to be a sailor on a ship at the mercy of a storm. When we chose that spot to set up camp, I knew a storm was brewing. 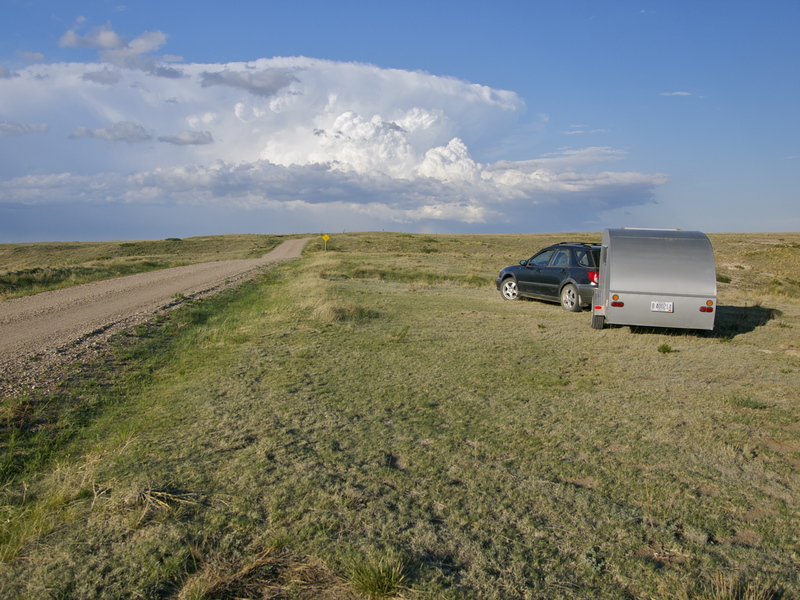 Massive thunderheads of big white puffy clouds were rising to incredible heights over the flat landscape. As the sun set, the sky turned deep purple, then black and the wind picked up, blowing those storm clouds in our direction. I thought about moving camp, off the bluff, farther away from the wind farm cross the valley with its massive wind turbine lightning rods. But I parked on the butte because I wanted to see the storm. 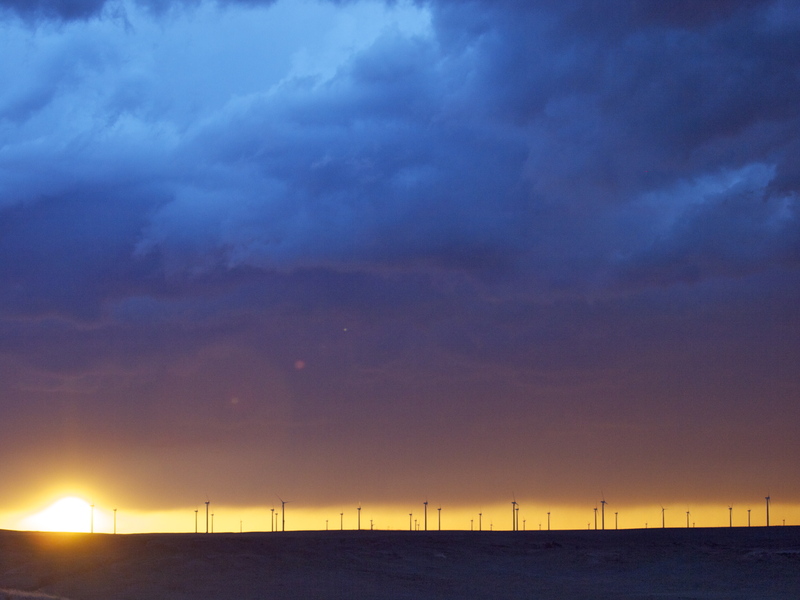 When lightning hits a wind farm, it comes to play. All night long, countless bolts fired down on those turbines. One bolt would hit, conducting a single solid stream of fire from the sky for several long seconds, then the single bolt would split into multiple flailing sideways tendrils that ricocheted from one turbine to another. I was sure the wind farm would be black and smoldering by morning. Once again, no photos. I couldn’t shoot through the windows of the Teardrop and going outside would have been insane. I tried at the window for a few minutes, but then made myself put down my camera and just watch. Somethings should not be experienced through a viewfinder. Sarah and I stayed up most of the night, watching the lightning out the windows, huddled in the middle of the Teardrop, trying not to touch anything in the event of a strike. My dogs slept soundly, foolishly unimpressed, as always, by lightning. The next morning I opened the door to find that the wind hadn’t moved us an inch. Even more shocking, the turbines were still tall, white and turning, apparently unfazed by the lightning storm. They must be grounded like no other. As for Sarah and I, we were dazed, mostly sleepless, but thrilled to have witnessed the storm of our lives. 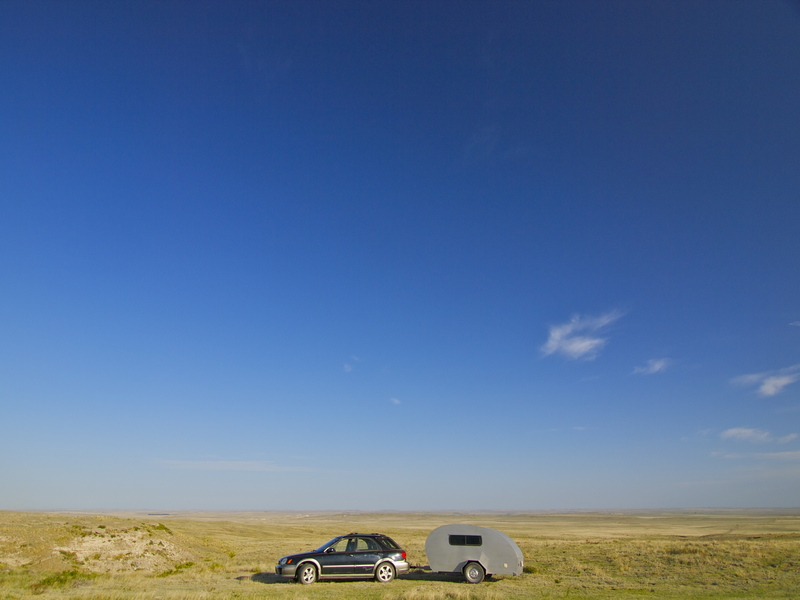 This entry was posted in Photography, Road tripping!, Uncategorized and tagged Teardrop trailer. Bookmark the permalink. I too love to camp, although it’s been a while. Mind you, I haven’t camped for an extended time like you, a month at most for me. Your descriptions made the whole thing come to life, I want to be there, to feel the wind and the freedom. Thanks for sharing. Well, I’m glad you, your dogs and your friend survived the storm, but what an amazing opportunity you had to capture some impressive photos…especially with your good photography skills. Lightning photos are very special, if done right. Wow, sounds intense! Glad everything/everyone was okay. Wow that was some storm. I would have been petrfied. You are so brave. Looks amazing!!! Love that smallish caravan? Lol! As far as lighting is concerned, being near a bunch of wind turbines is probably about as good a place to be as you could find. A strike is far more likely to hit one of those than it is a car/trailer sitting on the ground nearby. The wind might be another story, however. I wouldn’t want to be down wind if one of the blades rips off!! Awesome and frightening at the same time! I was on the edge of my seat! Thank you for sharing your photos and your story! Oh I love thunderstorms! Glad you were all safe in your teardrop and that your dogs don’t mind a little weather! I’m glad there was no incinerations!! The grasslands are awesome. There’s some really cool parts of them (with buttes and canyons) north west of Greeley, up by Grover, CO. Glad you survived…too bad there wasn’t a windmill anywhere nearby to act as a lightning rod!